281 pages | 3 Color Illus. | 141 B/W Illus. Knowledge on endohedral metallofullerenes (EMFs) has increased dramatically during the last decade. Numerous research findings have been reported, making it an opportune time to provide a systematic update on EMFs. 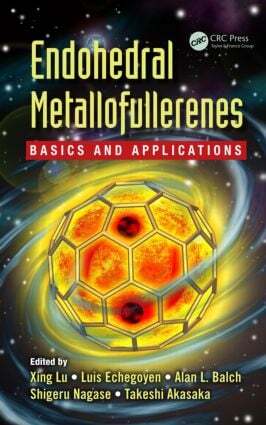 Endohedral Metallofullerenes: Basics and Applications presents the most comprehensive review on all aspects of EMFs including their generation, extraction and isolation, structural issues, theories, intrinsic properties, chemical behaviors, and potential applications. In this book, the editors have collected an impressive amount of information regarding this family of a truly sui generis form of matter. The book’s authors were chosen for their specific expertise in EMF research and have been gathered from top research groups from around the world. Graduate students, newcomers to the field, and experienced researchers alike will find this book a highly useful reference on the topic. Xing Lu is a professor at Huazhong University of Science and Technology and is supported by The National Thousand Talents Program of China. He received his PhD from Peking University and worked as a COE postdoctoral fellow at Nagoya University in Japan. Dr. Lu’s research interests lie in the rational design and facile generation of novel hybrid carbon materials with applications in energy storage/conversion and biology. He has published more than 60 scientific papers and has received the Osawa Award from the Fullerenes and Nanotubes Research Society of Japan. Luis Echegoyen is the Robert A. Welch Chair Professor of Chemistry at the University of Texas at El Paso. He received his PhD from the University of Puerto Rico at Rio Piedras. Dr. Echegoyen was the director of the Chemistry Division at the National Science Foundation, where he was instrumental in establishing new funding programs and research centers. He has research interests in fullerene electrochemistry, monolayer films, supramolecular chemistry, and spectroscopy; endohedral fullerene chemistry and electrochemistry; and carbon nano-onions, synthesis, derivatization, and fractionation. Dr. Echegoyen has published around 340 research articles and 43 book chapters. Alan L. Balch is a Distinguished Professor of Chemistry at the University of California, Davis. He earned a BA in chemistry from Cornell University and a PhD from Harvard University. Dr. Balch’s research interests include synthetic and structural studies of fullerenes and endohedral fullerenes, examination of metal–metal bonding and its effects on luminescence of transition metal complexes, and supramolecular chemistry in crystals. He has received the F. Albert Cotton Award in Synthetic Inorganic Chemistry from the American Chemical Society and is a Fellow of both the American Chemical Society and the American Association for the Advancement of Science. Shigeru Nagase is a former professor at Yokohama National University, Tokyo Metropolitan University, and the Institute for Molecular Science in Japan. He currently is a senior research fellow at the Fukui Institute for fundamental chemistry of Kyoto University in Japan. Dr. Nagase’s research interests include developing new molecules and reactions through close interplay between theory and experiment. He is a member of the International Academy of Quantum Molecular Science and has received the Commendation for Science and Technology from the MEXT, the Fukui Medal from the Asia-Pacific Association of Theoretical and Computational Chemists, and the Chemical Society of Japan Award. Takeshi Akasaka is a former professor at Niigata University and University of Tsukuba in Japan. He is now a professor emeritus of University of Tsukuba and a senior researcher at the Foundation for Advancement of International Science in Japan. Dr. Akasaka’s research interests include the organic chemistry of nanocarbons—fullerenes, endohedral metallofullerenes, and carbon nanotubes. He has received the Chemical Society of Japan Award for Creative Work, the Commendation for Science and Technology from the Ministry of Education, Culture, Sports, Science and Technology of Japan, and the Chemical Society of Japan Award.